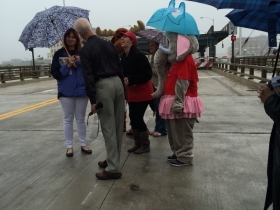 A small crowd gathered Wednesday afternoon at the corner of St. Paul Avenue and Water Street to watch the re-opening of the St. Paul Bridge, which was temporarily closed due to construction. Attendees seemed to mostly be residents and business owners of the Third Ward, who mingled and networked with each other, handing out business cards. Red Elephant Chocolate even suited up an employee in an elephant costume and offered free chocolates, making standing outside in the light drizzle a surprisingly delicious experience for all of those in attendance. Everyone huddled together, all trying to fit underneath the small tent that had been propped up to protect the microphone podium, as well as the ceremonial green ribbon. 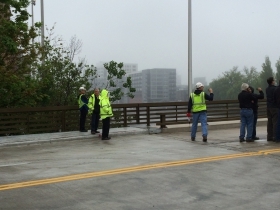 Construction workers were also at the scene for the bridge’s grand reentrance as it rose up, showcasing its vertical lift. The Commissioner of Public Works, Ghassan Korban, proudly kicked off the ceremony with a few facts about the history of the St. Paul Bridge, as well as the reasons behind its restoring. 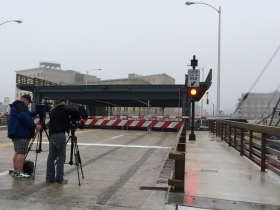 He pointed out one of the best new features, which is the bridge’s ability to hold streetcars. 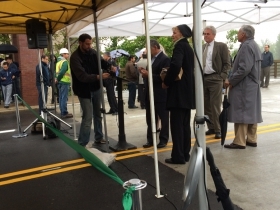 This feature was “designed pro-actively,” Korban noted, so as to be prepared for the future streetcar system. 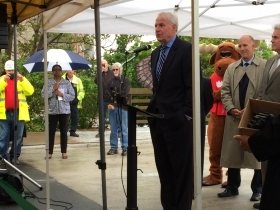 The microphone was then turned over to Mayor Tom Barrett, who announced to loud cheers that the project had been completed on time for the summer festival season and, most importantly, on budget. Third Ward residents and businesses were thanked extensively for their patience and cooperation during the remodeling process. Nice that they thought ahead for the Streetcar! 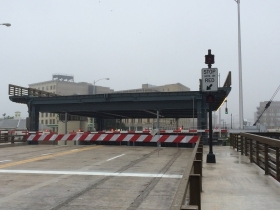 It’s a little disappointing that they only prepared the bridge itself for the streetcar (by providing gaps in the concrete to insert the rail), but apparently didn’t do the same for the rest of the block they closed for the bridge reconstruction (the block between Plankinton and Water). Tom D, do you know that or is it speculation? If the utilities have already been moved, it’s not expensive or difficult to get a concrete cutter in for the rail bed.